At 22 million people, metropolitan Mexico City is the largest urban area in our hemisphere. As the capital of New Spain, it governed a massive empire, stretching from the Philippines to Utah. The symbol of the eagle and the snake, which is at the center of our flag and on the seal of the city of Los Angeles (on the lower left corner), commemorates its founding. It is a modern-day megalopolis with pyramids, cathedrals, skyscrapers, huge parks and frantic urban blight. Uber’s biggest urban market is a mecca for foodies and culture. It is also in the center of a geological mosh pit. On Sept. 19, 1985, an earthquake registering 8.1 on the Richter scale struck Mexico City. Partly because of inadequate building codes, the death toll reached upward of 20,000 people. Electricity, telephones, the airport, the subway — all were down for several days. The government’s failure was especially glaring. Insular and out of touch after 56 years of single-party rule, then-President Miguel de la Madrid responded testily to offers of international help by declaring, “We are self-sufficient.” We were not, but we tried to be. In collective shock at the lack of response from their government, Mexicans self-organized. We coordinated massive relief efforts that saved many thousands of lives, and we rebuilt astonishingly fast. In 2000, when de la Madrid’s Institutional Revolutionary Party finally handed power over to the opposition, newly elected President Vicente Fox would declare that modern democracy in Mexico was the product of civil society finding its strength after the 1985 earthquake. Exactly 32 years later, on Sept. 19, 2017, a combination trepidatory (up-and-down) and oscillatory (side-to-side) 7.1 earthquake hit, 12 days after a nearby oscillatory 8.2 quake. The Richter scale measures energy released, not the violence of the quake, which has more to do with location, depth and geological characteristics of the affected area. So the 7.1 felt 10 times worse than the 8.2. You’ve seen the videos shot around the city by stunned citizens — and they are terrible. But unlike in 1985, government, civil society and the building codes are much more resilient. Electricity, telephones, the airport, the subway — all are functioning. In what has to be one of the great coincidences of the decade, two hours before the earthquake struck, the city performed its annual seismic drill. (It takes place on the anniversary of the 1985 quake.) We have an earthquake early warning system mounted on each of the city’s 15,000 CCTV cameras. Up to 90 seconds’ warning can make the difference between deaths in the hundreds or the thousands. Thirty-two years ago, the federal government turned away help that already had arrived at the Mexico City airport (including a Swiss canine unit trained to find bodies after an avalanche — a transferable skill. My father, the ambassador to Switzerland at the time, managed to get them into the city despite official disapproval.). This time, the Mexican tax authorities are waving import duties on international goods sent to help emergency efforts. Cellphone service is available, and Wi-Fi hot spots are free. Uber is shuttling volunteers to rescue operations. Amazon Mexico teamed up with the Red Cross to create a massive relief “wish list” so good Samaritans can donate directly. Google Maps has helped us identify the location of collapsed buildings so we can channel aid there. In his weekly column, Mexican journalist Leo Zuckermann declared himself twice as proud today as he was in 1985 to be a Chilango, as we Mexico City residents call ourselves. He’s proud to see how all of our efforts, and billions of dollars, have paid off in earthquake preparedness. But he’s also proud to see evidence of other seismic changes. Since 1985, we have built what is arguably the most sophisticated electoral system in the world. We have gone from being a country dependent on petrodollars to one that is a major manufacturing powerhouse, with a diversified economy that is among the biggest in the world. 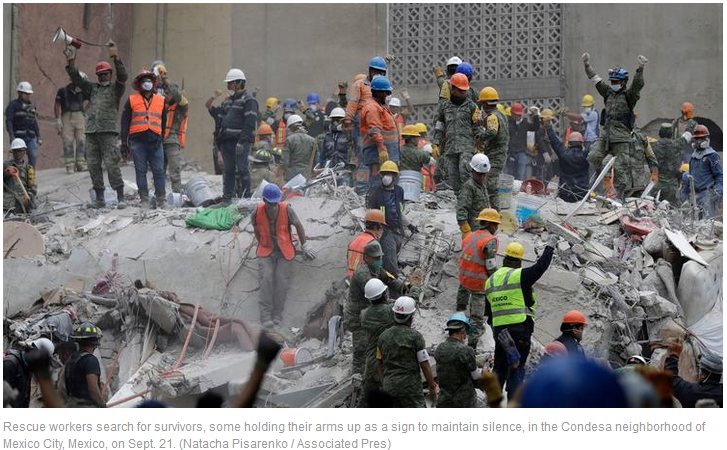 One thing that has not changed: the awe-inspiring selflessness and generosity that Mexicans show in crises. It was the driving force behind the civilian activism that would transform the country in the 1980s and 1990s. And it is evident today, even (perhaps especially) among the more than half of the population that hadn’t been born in 1985. That is particularly relevant now, when egotism is not only ubiquitous, but often celebrated. Not here. Not today. Of course there’s more work to be done. There always is. But if we created a democracy from the rubble of 1985, we can strengthen that democracy from the rubble of 2017, ending corruption and impunity in the same way that we ended single-party rule. As the dust settles, the signs are good.